Ever since the dawn of social networks in the early 2000s, marketers have been attempting to create curious online advertisements that people would be inclined to share. Peaking in popularity in 2015 with the rise of clickbait, viral marketing is still one of the most high risk high reward endeavors that companies partake in. Even though the past two years we have seen a notable decline in the popularity of this marketing method, it is still one of the most popular ways to increase the reach of a brand online. In addition, no matter how focused a social media campaign might be, chances are it will still have an element of increased potential virality in the strategy. Last year, we noted some of the best viral marketing campaigns of 2017, by taking a look at the notable and successful campaigns of some of the biggest brands. Now, even though we are still only a few months in the new year, we decided to do the same. It should be noted that the Super Bowl sporting event is the place where the biggest brands spent huge chunks of their marketing budgets. Plus, we are still just a few months in the new year, thus don’t be surprised by the fact that the viral campaigns we’ve featured do have their roots in the Super Bowl. Yet, it should also be obvious that all campaigns were aimed at social media virality and that social networking platforms did play a huge part in the popularity of the selected ads. That being said, we hope to inspire your creativity by taking a look at the best viral marketing campaigns of 2018. Without further adieu, let’s get started! Dominating the smart speaker market, the Amazon Echo is an amazing product that lets you interact with virtual assistant Alexa to do a range of different actions. For the most part, Amazon Alexa can answer you a range of questions, set up calendars or play music. If you have smart appliances in your home, the assistant can further be tweaked to perform a range of different actions in coherence with those appliances. Now, while the digital marketers in us do see how the content of this Super Bowl ad could be strategized in a far better way on social media alone. We further believe that implemented only on social media via a stretched out viral campaign would result in a bigger reach. Yet, Amazon decided to spend a few million and go for a more-of-a publicity stunt via a viral advertisement during the Super Bowl. The advertisement itself is extremely creative and managed to become one of the most talked about ads from the Super Bowl. It presents the creative idea that “Alexa lost her voice” and the echo smart functions would instead be replaced by celebrity voices. Part of the marketing genius of the ad also comes with the selection of the celebrities chosen to be featured in the ad. It featured some infamous faces, such as Cardi B, Gordon Ramsay and Sir Anthony Hopkins. And while most celebrities do have their own brand, the celebrities in questions are infamous for their powerful characters. Not to mention, the video is designed beautifully with some intricate details, such as the chef Gordon Ramsay answering to cooking related questions. And while we would love to see such a feature actually be available on the echo, it is but an ad. Whether intentional or not, this advertisement comes at the heels of another viral trend related to an Amazon Echo commercial. The ad in question is a three-minute piece explaining all the features of the Amazon Echo via a presented family setting. You think you are reading a Locowise blog post, but look – the background is white. It’s a #TideAd. Okay, attempts of blog humor aside, #TideAd is one of the most notable viral marketing campaigns of the year so far. First aired during the Super Bowl, the ad features the Stranger Things star David Harbour in multiple scenarios, explaining that every ad you’ve ever seen is in fact a tide ad. The creative idea notes on the fact that people in advertisements are usually wearing clean clothes, explaining that only a powerful detergent, such as Tide, can make the clothes so white and clean. Of course, much like most successful viral ads, this one doesn’t take itself too seriously. With the charm of David Harbour, the marketers have in a sense recreated notable moments from other viral advertisements throughout the years. This in itself, has increased the potential of the ad by a huge margin, resulting in a social media frenzy to share the “lulz” that everything is in fact a #TideAd. The advertisement itself came on the heels of another viral trend related to Tide that became popular in the beginning of 2018. Becoming popular among teens, and showing the dark side of viral trends, the Tide Pod challenge featured people making videos of biting or eating the extremely hazardous detergent pods. While the company had nothing to do with this trend, they did manage to gracefully avert the crisis around their brand. They did so by tackling the issue head on, first telling challenges to call poison control and then by sharing this hilarious video on Twitter featuring the infamous US football player Robert “Gronk” Gronkowski. 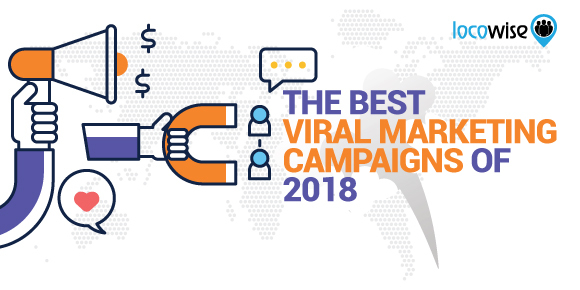 It is not surprising that most viral marketing campaigns of 2018 from the biggest brands and companies were released during or at the time of the Super Bowl. One of the biggest sporting events in the U.S., the Super Bowl has become synonymous with viral advertisements. In fact, especially this year, the running joke on social media was that most people watched the event not for the sport itself, but for the advertisements instead. Whether or not this is true, we can’t tell. Yet, we can tip our hats off to Netflix for their extremely successful marketing move with the Netflix Cloverfield Paradox Marketing Campaign. Now, while this is not the usual viral marketing campaign, it was an either extremely well thought out publicity stunt or just a creative risk the company decided to take. Yet, we do believe that the campaign in question was in fact calculated and planned. So, what did Netflix do? They didn’t simply make a post or a video go viral, but instead made a movie that is available on the platform go viral. Here’s how they did it. The story of The Cloverfield Paradox is quite long and notes on the continuous battle between the digital video-on-demand turned production company Netflix and the old school movie theater release to physical media Hollywood. The movie in question was produced by Paramount Pictures as part of the cult following classic movie-verse of “Cloverfield.” Netflix reportedly acquired the right for the movie for a hefty amount. And as social media clickbait posts go, “what happens next will truly amaze you,” at least, if you are into marketing moves. Instead of putting out advertisements for the release date of the movie, Netflix immediately released it on their platform. The announcement trailer was shown during the Super Bowl taking the spotlight from all other movie trailers for full feature films that are to be released later this year. The reason why we love this viral marketing campaign by Netflix and the stunt they did is that it incorporates a number of factors. First, the company made a stance that they are not reliant on big movie studios. The company showed that while for their Hollywood counterparts the buildup to a theatrical release is important, Netflix can simply release a movie on their platform in an instant. Second, the release and the announcement trailer were aired at a time when the movie industry was closely following what was happening on their screens to note the “next big trailer” during the Super Bowl. Third, Netflix took advantage of social media, instantly releasing the trailer and the announcement on all available platforms. Fourth, the stunt ensured that critics in the industry will add to the virality by releasing their reviews of the movie. And last, but not least, the movie they chose to release is a part of a cult following classic that is surrounded by mystery and theories thus ensuring that the viral potential would be increased by people and fans who find the little details to ensure that they understand or to simply theorize for the movieverse. The viral marketing stunt of Netflix was pure perfection. Tide wasn’t the only winner when it comes to successful Super Bowl ads aimed at true viral marketing potential. Doritos and Mountain Dew combined forces to issue a creative ad that aired during the Super Bowl. It was transparent that the ad in question was focused on potential virality that it eventually managed to achieve. Yet, much like most successful ads that go popular on social media, the #Spitfire and #Icecold battle was created with a huge notion of self-awareness. It featured Peter Dinklage, Morgan Freeman in a lip sync battle with cameos from Busta Rhymes and Missy Elliot. Despite the hashtags not creating a huge trend, the ad itself did get people talking and is by far one of the most popular ads of 2018, thus worth the honorable mention on our list. You can watch the video of the ad above. If you’d like to get your hands on some high quality social media metrics, then try out Locowise, for free, for seven days. It’s all you need on your audience and your competitors, in one place.